The Government of Bangladesh has signed an agreement with a Bandgladesh-China joint venture to upgrade 190 kilometers of the Elenga–Hatikumrul–Rangpur section of the Dhaka-Northwest Corridor, under the SASEC program. Sri Lanka’s President Maithripala Sirisena and Mr. Takehiko Nakao, President, Asian Development Bank, signed three agreements, including a $300-million loan to construct about 5.3 kilometers of an elevated toll highway linking Colombo's international port and the country’s expressway network under the South Asian Subregional Economic Cooperation Port Access Elevated Highway Project. The SASEC Secretariat wishes peace, prosperity, and joy to everyone in 2019. Myanmar State Counselor Aung San Suu Kyi undertook her first state visit to Nepal. She paid a courtesy call to Nepal Prime Minister KP Sharma Oli where they explored how to further expand their bilateral ties. At the Nepal Chamber Expo 2018, she delivered a speech urging both countries to improve economic relations. She also emphasized both countries’ membership to the SASEC program. Technology helps set the appropriate balance between facilitation and enforcement by border agencies. In this ADB blog entry, Mr. Ronald Butiong, Director, Regional Cooperation and Operations Coordination, South Asia Department, ADB, discusses how the electronic cargo tracking system uses information and communication technology, satellite positioning systems, and high security seals to allow organizations to monitor the movement of cargo, thereby enhancing trade facilitation in South Asia. A new project to improve Nepal’s East-West Highway is set to strengthen regional connectivity, promote growth and trade, and improve road safety. An 87-kilometer section of the East-West Highway, also known as the Mahendra Highway, will be widened to four lanes and will be improved to include a center median, service lanes in populated areas, and a drainage system. A toll highway to be built in central Colombo will ease traffic congestion, improve connectivity, and facilitate trade logistics in Sri Lanka. The Asian Development Bank has approved a $300 million loan to help in the construction of about 5.3 kilometers of the highway, under the SASEC Port Access Elevated Highway Project. This case study reviews how the Subregional Transport Facilitation Project removed roadblocks to Nepal's trade. The project, approved in 4 November 2004 and completed in 21 September 2010, made flow of import and export goods to Nepal easier, faster, and smoother. Learn how the project lowered the cost of capital for cargo in Nepal by 12% annually, making the country better connected to the subregional economy. The Executive Committee of the National Economic Council of the Government of Bangladesh approved revisions to the project to upgrade the Joydevpur-Chandra-Tangail-Elenga Road into a four-lane highway. Revisions include extension of deadline and increase in funding. 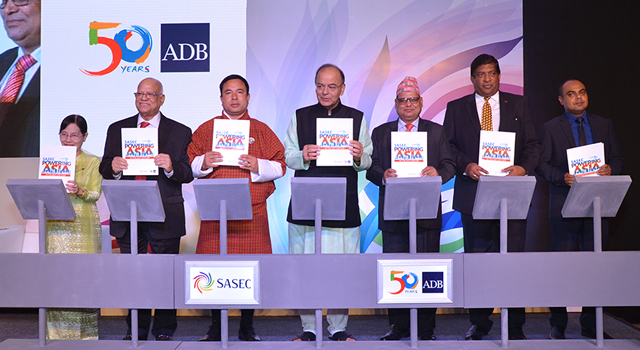 The Asian Development Bank will provide financing support through the South Asia Subregional Economic Cooperation (SASEC) road connectivity project. The Government of India launched the test phase for railway movement of goods entering Nepal via the Biratnagar check post. The Container Corporation of India began carrying freight bound for Jogbani in Bihar, the nearest rail station to Biratnagar, on 25 April 2018. This development follows implementation of the electronic cargo tracking system. The National Highways Authority of India signed on 11 April 2018 an agreement to widen the Yagyi-Kalewa section of the India-Myanmar-Thailand Trilateral Highway. Construction is also underway for the Imphal-Kangchup-Tamenglong road under the SASEC Road Connectivity Investment Program. These projects will improve the flow of vehicular traffic and enhance trade, health services, and tourism in India, Myanmar, and Thailand. South Asian Association for Regional Cooperation (SAARC) Secretary General Amjad Hussain Sial met with ADB President Takehiko Nakao to discuss ways to increase cooperation between SAARC and ADB. Mr. Sial noted the prospects for better cooperation between SAARC and SASEC. The SASEC Secretariat wishes peace, prosperity, and joy to all this 2018. ADB held a Regional Cooperation and Integration (RCI) Week to asses strategic RCI themes and initiatives in Asia and the Pacific and to define ADB implementation of its RCI Operational Plan. ADB also presented RCI Best Performers Awards, recognizing the SASEC Program for the SASEC Vision: Powering Asia in the 21st Century, and for leading the SASEC Road Connectivity Investment Program Multitranche Financing Facility Project. Trading across borders, a key component of a country's ease of doing business, can be quantified through a time release study (TRS). This commentary discusses the outcomes of a TRS conducted at the Jawaharlal Nehru Custom House (JNCH), which identified practices that will allow India to achieve the average release time of 72 hours, and proposed recommendations that the Customs department can lead going forward. SASEC conceptualized the Information Highway Project to assist cooperation in the region and realize SASEC's goals of social and trade development. The project is being implemented in Bangladesh, Bhutan, India, and Nepal with the aim of making ICT more accessible to remote communities in these countries. It is expected to help SASEC countries increase their productivity and participate fully in the global information economy. The Government of Bangladesh will develop four land ports as part of its initiatives to increase trade and commerce with India. Around $85.2 million was approved by Bangladesh's Executive National Economic Council to improve the Sheola, Bhomra, and Ramgarh land ports. Another project will be undertaken to modernize security at Benapole land port. India’s Cabinet Committee on Economic Affairs, chaired by Prime Minister Narendra Modi, gave its approval for a $253,406,409 project to be implemented by the state-run National Highways and Infrastructure Development Corporation. The project, part of the SASEC Road Connectivity Investment Program, will upgrade and widen 65 kilometers of the Imphal-Moreh section of National Highway 39 in northeastern India. An electronic tracking system will soon ease traffic-in-transit for cargo traveling by road and rail from Kolkata to four major Customs points of Nepal, including the Raxaul route. Mr. Sandeep Kumar, Customs Commissioner, India, and Mr. Rabi Shanker Sainju, Commerce Ministry Joint Secretary, Nepal, signed a memorandum of intent to pilot the tracking system for a trial period of at least 90 days in late 2017. The SASEC Secretariat is happy to announce that the Government of Myanmar has joined the SASEC partnership as a full member on 21 February 2017. 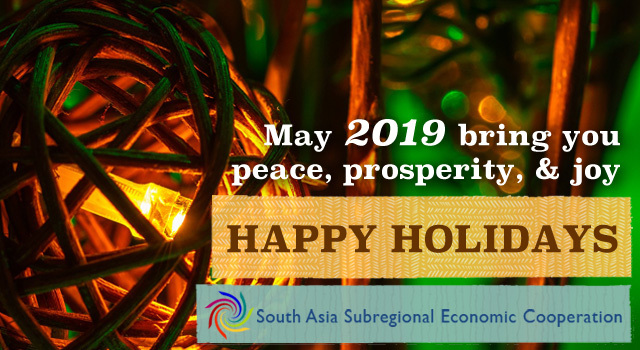 The South Asia Subregional Economic Cooperation (SASEC) Program wishes everyone peace, prosperity, and good health. Two of three South Asia Subregional Economic Cooperation project components are seeing progress in Bhutan. A planned mini dry port project aims to provide cargo and other commercial vehicles a route that avoids traffic jams in the border town of Phuentsholing. A 2.66-kilometer bypass will also be built to connect Bau Bazaar in Jaigon and the Phuentsholing-Thimphu highway. A Regional Workshop on the SASEC Research and Training Network was held to assess the results and achievements of the SASEC Information Highway Project. The Meeting reviewed project implementation, discussed knowledge products, and summarized project benefits to rural communities. It also proposed ways to facilitate sustainable ICT cooperation among the four countries. The Asian Development Bank has approved a loan for $187 million to Nepal for the SASEC Roads Improvement Project, which will upgrade transport connectivity and bring transformational gains by making social services more accessible, opening up previously untapped economic opportunities, and supporting trade between Nepal and India. The Sri Lanka Ports Authority and the Asian Development Bank has engaged the Maritime and Transport Business Solution company to develop a National Ports Master Plan to further strengthen Sri Lanka's port sector. ADB has approved a multitranche financing facility and grant of $500 million for the Visakhapatnam-Chennai Industrial Corridor Development Program to develop India’s first coastal industrial corridor, with the Government of India also contributing $215 million in funding. The Visakhapatnam-Chennai Industrial Corridor is a key section of India’s planned East Coast Economic Corridor. Bhutan, Nepal, and Sri Lanka have expressed interest in adopting best practices of the Indian Trade Portal in setting up their own trade portals to promote international trade. Trade portals to be set up by Bhutan and Nepal will also be useful for cargo being routed through India, and will contribute to the common documentation system needed to implement the World Trade Organization's Trade Facilitation Agreement. The South Asia Subregional Economic Cooperation (SASEC) Program wishes everyone a happy and peaceful new year. Mr. Madhu Kumar Marasini, Joint Secretary, Ministry of Finance represented the Government of Nepal at the official launch of activities under a $1.5 million technical assistance project financed by the Japan Fund for Poverty Reduction, on 21 May 2014 in Kathmandu, Nepal. The capacity development technical assistance will support trade facilitation initiatives being carried out under the South Asia Subregional Economic Cooperation (SASEC) Trade Facilitation Program. ADB is providing $48 million to help goods move more smoothly in and out of Bangladesh Bhutan and Nepal. ADB's South Asia Regional Cooperation Divison and the World Customs Organization organized a workshop held in Thimpu Bhutan from 26-28 November to help prepare Bhutans accession to the Revised Kyoto Convention. Trade facilitation and transport officials of SASEC countries reviewed planned priority sub-regional projects totaling over $4 billion over the next three years. ADB in cooperation with UNESCAP organized the Asia-Pacific Trade Facilitation Forum (APTFF) held on 30-31 October 2012. Following the SASEC Trade Facilitation and Transport Working Group (TFTW) Meeting in Bangkok in October 2011 the TFTWG met again in Kolkata on 5 March 2012 and agreed on a list of investment and technical assistance projects.